Sherpai, also known as Suri bowls, are traditional wooden measuring bowls, bound and ornamented with brass, which were used to measure rice, paddy and other grains well before the advent of weighing scales. These were mainly to be found in the homes of Bengal`s wealthy farmers and zamindars in the days of yore and were made only in Lokepur (Lakshmipur) village in Suri block of Birbhum district. It is not as if measuring bowls were not used by ordinary, less affluent people - but the ornamented Suri variety would have been well outside their budgets.  The term Sherpai is a derivative of two terms of the weights and measures system then prevalent in Bengal before the standardization of weights to the metric system in 1956: the seer or ser or sher (Bengali) and pai. A ser in Bengal was equivalent to 80 tolas of rice and after standardization, it equalled 933.1 grams. The tola was a 19th century weight standard for gold and silver coins and one tola was equivalent to approximately 11.66 grams. The pau or poa (Bengali) was a quarter of a ser and it is erroneously held by some that the term pai in Sherpai was derived from pau. In actual fact, the pai equalled half a ser or 8 chhotaaks (a chhotaak being one sixteenth of a ser or about 2 ounces). 1 mon or maund equalled 40 sers. Also referred to as kunke, these bowls usually came in sets of twelve and were graded in size from the largest to the smallest and placed one on top of the other. A set of 12 comprised measures ranging from 1 mon (maund), followed by 1/2 mon, 10 ser, 5 ser, 2.5 ser, 1 ser, 1 pai, 1 adh pai (half pai), 1 poa (pau), 1 adh poa (half poa), and the smallest, 1 chhotaak. The set would be topped by an ornamental cap which was the 12th item in the set. The total height of these twelve bowls could be well over five feet. Sometimes, the largest bowl had a circumference of 50" and a height of 17 " with a capacity for 2 mon or 80 ser. For those whose needs were less, smaller bowls were available, not including the cap, in sets of eight (5 sers to one chhotaak), seven (2.5 seers to one chhotaak), and the most common, six bowls (one seer to one chhotaak), this being generally used by households for their daily needs. Traditionally, the bowls were hand carved and chiseled from the wood of the mango, jackfruit, palm, sirish (Rain Tree) or sishu (Indian Rosewood) trees; today only mango and jackfruit wood are used and the lathe machine to turn the bowls has substituted hand carving. The black colour of the wood is obtained by soaking herbs like haritaki (terminalia chebula, commonly known as black or chebulic myrobalan) and amla (indian gooseberry) in water for two days and combining this with glue (Fevicol, these days) to form a permanent dye. The bowls are ornamented with engraved and punched brass. 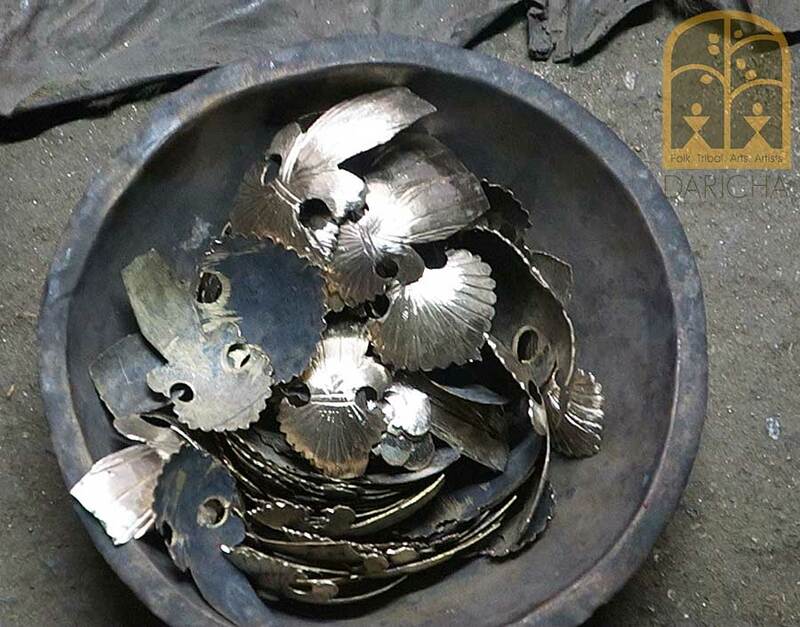 The brass is obtained by cutting brass buckets and utensils bought from the marketplace. 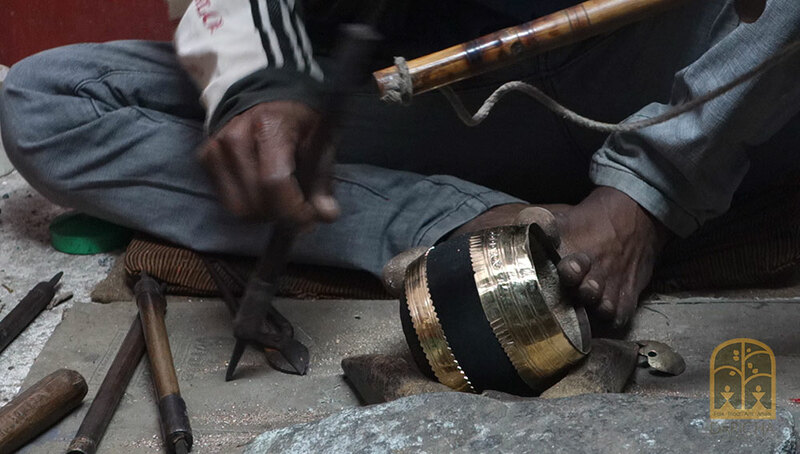 Two strips of brass are hammered into shape, welded at the ends and fitted to encase each bowl - the broader band near the mouth of the bowl and the narrower one near the base. These bands are polished and engraved first before being firmly fitted on to the bowl. Designs are punched into these strips using a manual drill. Mounted on these strips and on the exposed wooden surface with miniscule brass rivets, are exquisitely designed brass motifs of fishes, birds and flowers. These embellishments are painstakingly cut manually from stencilled brass sheets and engraved with a file, by resting it against a unique wooden contraption known as "khanda-bari". Traditionally, each measuring bowl had a brass disc at its base incised with a rosette. The current custodians of the art claim that the first sherpai bowls were made towards the end of the 18th century (circa 1785) and supplied to Calcutta via a Jeevan Pharmacy in Suri. 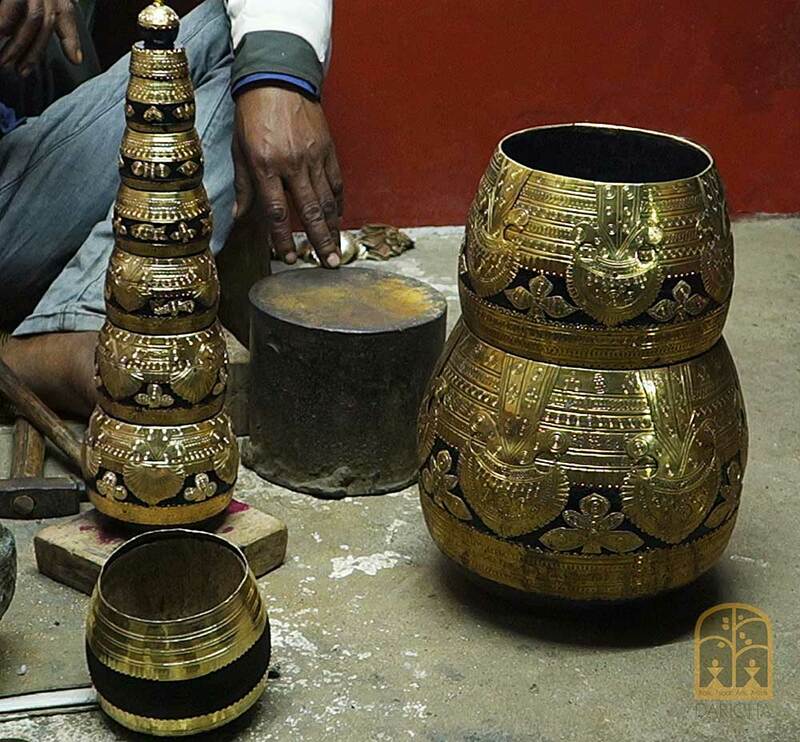 The artisan was Nobin Karmakar and it was his descendants who continued with this art. Even in Nobin`s time, they were made to order and with just a single sherpai artisan, they were not readily obtainable in spite of a considerable demand for them among Europeans. 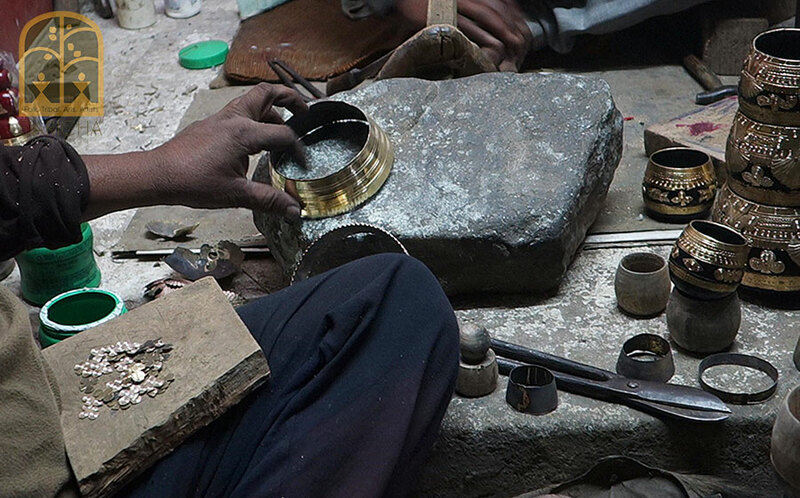 In 1964, a master artisan named Kamala Kanto Karmakar won the national award for his Sherpai craftsmanship. This not only gave a fillip to the demand for Sherpai but it also inspired his nephew, Kartik Karmakar, who was at the time employed with the Durgapur Steel Plant, to give up his job and follow in his uncle`s footsteps. Kartik soon established himself as a master artist as well and went on to become a National Awardee himself. 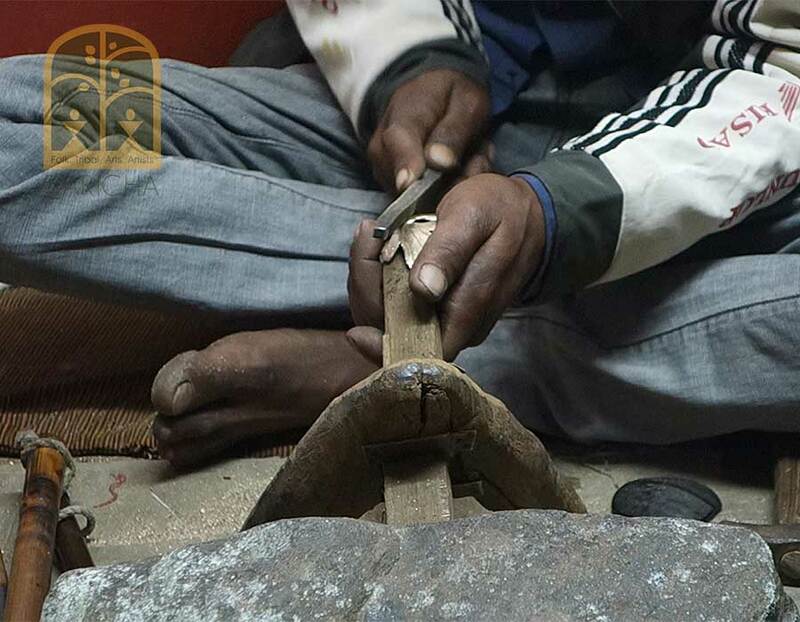 After his uncle`s demise, Kartik remained the sole master artisan until his own death in 2014. His disciples, comprising his brother, his son and particularly, his son-in-law Bholanath Karmakar, who is also a national award recipient, now continue to uphold the art. Bholanath`s wife, Ruma, has also learnt to engrave the brass ornaments. Meanwhile, from about the seventies, the changing needs and disappearance of the traditional market reduced these bowls to eye catching items of home decor. With functionality no longer a parameter, small sets of varying numbers of bowls are made and the smallest set of 7 pieces is only about a foot high. Depending on the sizes, the prices range from about Rs 1500 for the smallest to Rs 30,000 for a regular 12 piece set. While there is a fair amount of sales of Sherpai showpieces today, thanks to the assistance of the District Industries Centre (DIC) under the West Bengal government, it would ideally take at least three people to work simultaneously in order to craft sufficient quantities. With only one family carrying on with this craft in all of West Bengal, Sherpai remains firmly relegated to the languishing crafts category.